Reddit can feel like a cesspool of hate most days, but occasionally, it turns up some internet gems. Today, for example, a user posted a bonkers photo of a posse of large, intimidating-looking birds chilling on an airplane. “My captain friend sent me this photo,” user lensoo wrote in the post. “Saudi prince bought ticket [sic] for his 80 hawks.” The photo appears to be unedited, but it left us asking a bunch of questions. For example: What the hell are so many birds doing on a plane? Where are they going? 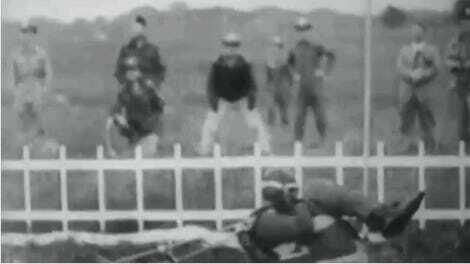 Are they wearing blindfolds, or helmets? Are they okay? Is this normal? Why does the internet yield so many delightfully bizarre things? Are we losing our damn minds? One commenter in the Reddit thread helpfully pointed out that a similar post surfaced on the site a few years ago. “If you fly Etihad or Emirates or Qatar enough you will eventually see someone flying in first class with a falcon sitting next to them,” the commenter wrote. With this little tip in mind, we decided to investigate the birds-on-a-plane phenomenon. Sure enough, we found that it’s not out of the question to see large birds of prey hanging out in the same cabin as regular passengers on flights near the Persian Gulf. As Business Insider reported in 2013, falconry is popular in the United Arab Emirates, and at least one airline, Etihad Airways, has designated policies regarding falcon-related travel. 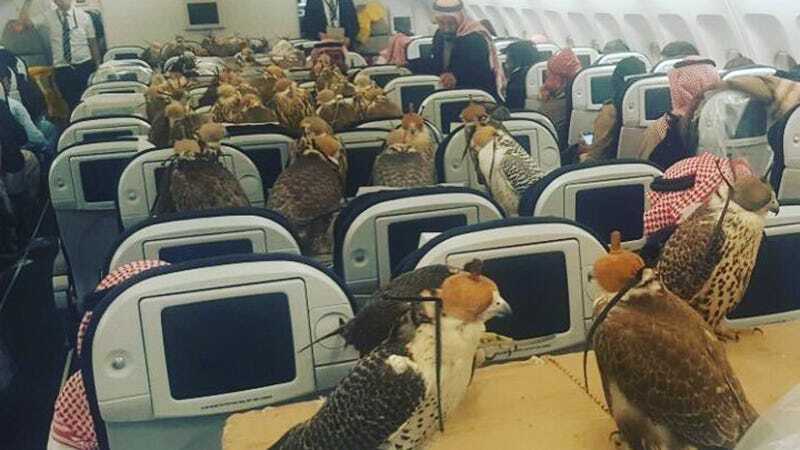 As Atlas Obscura reported in 2015, falcons are allowed to travel just like normal passengers to and from the UAE—just as long as they’ve gone through many of the same security checks as a normal passenger, including a specially issued passport. Between 2002 and 2013, the UAE government reportedly issued more than 28,000 falcon passports. Although it sounds a little unusual, the falcon passport system was created in 2002 by the Convention on International Trade in Endangered Species of Flora and Fauna (CITES) to combat falcon smuggling. The birds are wildly popular for use in hunting and competitive sports. But while all of this information is fine and good, it still doesn’t help us answer why so many birds—who may not actually be hawks, but rather falcons—were loaded up on one flight, or where they were going. That, alas, may be lost to the internet’s sands of time. For now, we can only hope the bird army is going somewhere nice and warm.